Every new parent needs a wingman, especially during diaper changes. Especially when you’re on the go. The new Vianetic 5-in-1 Diaper Backpack has everything you could ever want or need for outings with your kiddo. Invented by a dad after a family road trip (we totally get it!)—. The Vianetic uses a magnet release lock to flip the bag open instantly. No more frantic zipper fumbling while holding a baby with a diaper blowout (woot-woot!). 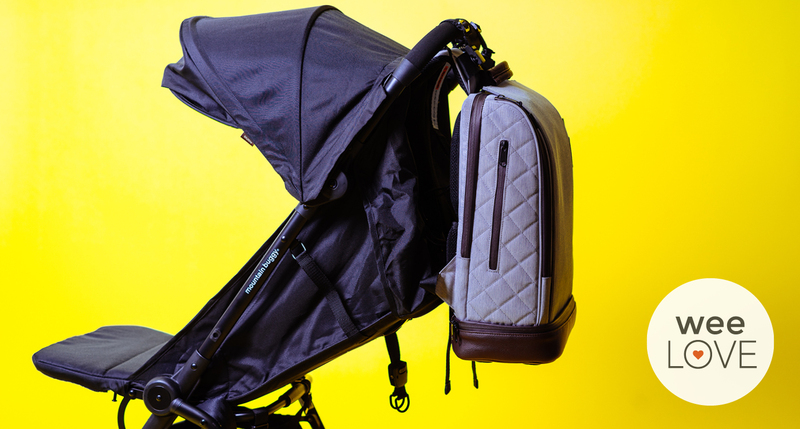 The foldout changing station is integrated into the bag and the interior pods are all removable and modular—which keeps everything organized and easy to access. You can even connect the entire bag to the front seat headrest and unfold the pad for a secure changing setup in the car. And did we mention that there are pockets galore? Keep your laptop safe, tuck in passports, protect your sunglasses, and hide away your cell and wallet. There’s an awesome insulated pocket with capacity for up to three bottles, food containers, or a wine bottle (in case you’re on a kid-free picnic). And the compartment on the bottom has a wet bag for stashing dirty clothes, asap. You can also charge your phone from the bag’s USB port. Yep. The Vianetic is a smart, sleek, modern bag that both men and women will gladly carry (and rely on!) when reporting for diaper duty. Previous story weeLove: Bye-bye Bib. Hello, Pib!